Feb 7, 2019 | What Am I Reading? 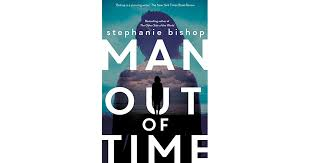 Stephanie Bishop’s new novel Man Out of Time (Hachette Australia Books 2018) was nothing I expected. This extraordinary portrait of a man and his descent into madness, and the deterioration of his relationships with those around him, is presented in beautiful language that reads like a meditation on life, love and loss. This is literary writing at its finest. The plot is there but is so subtly incorporated into the portrayal of the characters and the existential musings, that it seems to occur almost without us noticing. We become so completely immersed in the interior lives of the three main characters that the inevitability of the things that happen becomes almost incidental to the way that they happen and the inevitable psychological effects. The simple precis of the plot is this: Stella’s father, Leon, disappears in September 2001. The book then plunges backwards into the history of Stella’s troubled relationship with her father, who once foretold that she would write about him only when he was dead. Leon’s psychological instability and the management of this by his wife, Frances, were a constant background soundtrack to Stella’s childhood. His behaviour was often disappointing, frequently difficult to comprehend, occasionally disturbing. This story – told at various points from the perspective of all three characters – is a non-linear, very literary exploration of what it means to be born at the wrong time and to run out of time. It depicts the struggle of a daughter to help her father when he has let her down at crucial points in her life, and it is a nuanced examination of the traits we inherit and the memories we hold, and how they unsettle our future and determine how we perceive our choices. It is a study of mental illness passed along as a family trait: the beauty and power of its difference as well as the trauma and danger of its grip.